Inaaya Naumi Kemmu recently turned one, and her parents Soha and Kunal Kemmu threw a grand party for her. While the world is celebrating Halloween on October 31, 2018, how can our super-adorable celeb babies stay behind? 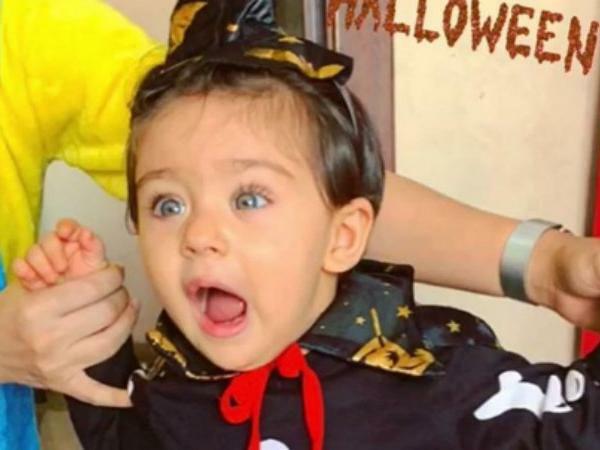 Soha Ali Khan delighted her fans with the glimpse of Halloween celebrations and we can spot little Inaaya Naumi Kemmu in a skeleton outfit with a cape. Soha posted her capture on her Instagram. Inaaya is dressed up in a skeleton print outfit and is seen trying to scare people with her spooky avatar that is so cute that it can melt even the coldest of hearts. Captioned as, "Peek a boooo!! #happyhalloween in case you are wondering I’m a size zero witch #scarytrends", check out the photo we are talking about. Inaaya recently turned one, and her parents Soha and Kunal Kemmu threw a grand party for her. The party was attended by Inaaya’s cousin, Taimur Ali Khan and his mother Kareena Kapoor Khan. Shreyas Talpade’s daughter and wife were also spotted at the party. During Rakhi celebrations Inaaya and brother Taimur Ali Khan were seen playing with each other without any idea of being clicked. Announcing Inaaya’s birthday plans, Soha shared an Instagram post listing all her achievements; her favourite words, for instance, include ‘mama’, ‘papa’, ‘dada’ and ‘gogum’. Her abilities include clapping, giving flying kisses and making animal sounds. It proudly declared that she is 22 pounds in weight and has 8 teeth. While Taimur and the paparazzi's mutual love had made headlines before, Inaaya's pictures as she takes a stroll on the streets of Mumbai often go viral. The cousins also keep visiting each other at their respective houses for 'play dates.